Paul Johnson’s spread option will serve as the Jackets’ offensive philosophy once again this year, and it will have a new leader in quarterback Justin Thomas. Originally recruited to play defensive back for the Alabama Crimson Tide, the 5’11”, 185 pound sophomore ran a similar offense in high school and is ready to take the reins after playing behind Vad Lee last season. He ran the 40-yard dash in just 4.3 seconds coming out of high school, making him one of the fastest quarterbacks in all of college football. His athletic ability and decision making when running the ball is a perfect fit for this offense. Senior B-back Zach Laskey will be lining up right behind Thomas on most plays. He had a breakout year in 2012, rushing for 697 yards, and scored eight touchdowns (seven on the ground) last year. His 6’1”, 218 pound frame can take the beatings that come with rushing straight into the trenches while staying low and pushing forward to gain yards. He will see a lot of touches again this year, both as the second option on triple option plays and on handoffs designed to go straight to him. Senior Matt Connors will serve as his backup and Synjyn Days will also see time as well. The Jackets are loaded with experience at the A-back position, which should allow for more plays to the outside by rotating players and keeping their bodies fresh. Seniors Tony Zenon, B.J. Bostic, Synjyn Days, Deon Hill and Charles Perkins, along with junior Broderick Snoddy should all expect to see significant playing time. Zenon and Perkins are slated to start at A-back versus Wofford. The receiving corps will not see as many passes thrown their way compared to last year, but that does not mean that big plays on deep balls are out of the question. Senior DeAndre Smelter is the go-to receiver and had a major impact on the team last season, catching 21 passes for 345 yards and four touchdowns. He should also be more of an impact on the field this year, even if the stats do not show it. Senior Darren Waller will sit out the first two games for violating team rules but should take over the other starting wide receiver position when he returns. At 6’5”, he is the tallest receiver on the team. This is the second time Waller has been suspended for the first two game of the season. The team lost three long-time starters on the offensive line over the offseason due to graduation but added a lot of freshman depth with this past recruiting class. Senior Shaquille Mason and junior Bryan Chamberlain remain as starters at guard and tackle, while junior Trey Braun will most likely take over at the left guard position after starting eight games there last year. Sophomore Freddie Burden will start the year at center, and true freshman Chris Griffin will start at left tackle and protect Thomas’ blind side. Mason is the most experienced and will be the leader of the offensive line. Last year was a relatively down year for the Jackets’ offense. This season, expect the offense to revert to its ground-game roots with Thomas under center and for the play calling to be similar to the Washington and Joshua Nesbitt days. 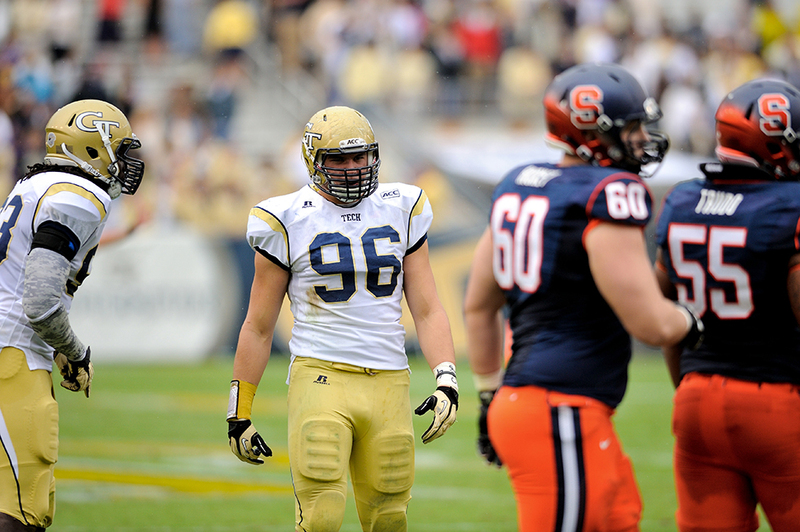 The Jackets graduated both starting defensive ends this past season. Jeremiah Attaochu is now with the San Diego Chargers, and Emanuel Dieke is trying to make it in the NFL too. Starting this year will be true freshman Keshun Freeman, who was forced into playing time after several transfers and players who were ineligible. Tyler Stargel will start opposite Freeman, and both players will have their work cut out for them this season. Senior Shawn Green and junior Adam Gotsis will start at the defensive tackle positions this season. Gotsis is a returning starter and made a name for himself last season after coming up with several big interceptions, sacks and blocked kicks. Green is very effective when he is healthy, but he has suffered lingering injuries the past two seasons. Backing up Green and Gotsis will be sophomores Pat Gamble and Francis Kallon. Both have excellent size and should be good depth in the interior defensive line. Kallon was a highly rated recruit, and fans are waiting for his breakout season. The linebacker core will be headlined by senior Quayshawn Nealy and junior Tyler Marcodes. Nealy is one of the most talented players on the team and will play a key role in stopping the other team’s tight ends in coverage and stopping the run. Sophomore Paul Davis will be the first linebacker off the bench this season. He was very effective last year as a true freshman, and his motor and tenacity make him a very fun player to watch. Graduates Jemea Thomas and Louis Young will be tough for this year’s team to replace. Both are currently fighting for NFL roster spots. Junior DJ White is the most experienced corner on the team. Redshirt sophomore Lynn Griffin was supposed to start the season but is suspended for the first two games. Redshirt junior Chris Milton will start in his place. Once Griffin comes back, Milton will be able to play safety or cornerback. The Austin twins will play a key role this year as well. Senior Isaiah Johnson returns this season along with junior Jamal Golden. Both suffered injuries last season, and their depth and experience will be needed this year. Junior Demond Smith will also see a lot of playing time, and it hasn’t been determined who will be starting at safety this year. Tech’s secondary will have plenty of depth and will often have three safeties play at one time. Tech lost many key players this past season: Six graduated, and a couple more were ineligible this season. The pass rush is unknown, and, because of that, the defense under Roof might take a step back. Sophomore Harrison Butker returns as Tech’s kicker and will be the primary specialist for kickoffs, field goals and PATs. He was the Jackets’ leading scorer with 83 points last year, converting on 10 of his 14 field goal attempts and 53 of 54 PAT tries. He also kicked off 73 times, 30 of which were taken for a touchback. Sophomore Ryan Rodwell will be returning as Tech’s Punter. Rodwell, was redshirted last season but was Tech’s primary punter in 2012 after Sean Poole was lost to injury. He averaged 39.7 yards on 13 punts in 2012 and twice pinned the opposition inside its own 20 yard line. Smelter is expected to be the main punt returner once again after racking up 124 yards on 11 returns last year. He will also occasionally return kickoffs, though junior Jamal Golden will see the most touches after missing most of 2013 with a shoulder injury. After Golden went down during the North Carolina game last season, the special teams took a huge hit, and the team wasn’t as effective without Golden’s breakaway ability returning kickoffs and punts. Sophomores Dennis Andrews and Lynn Griffin will also see some time on kickoff returns. Butker looks to continue improving upon last year. He did a good job compared to Tech kickers before him, but there is room to improve. Golden will excel in the return game.